Durban - Faf du Plessis has called on the Proteas to maintain their momentum after leading the side to a commanding eight-wicket victory over New Zealand, in his debut as captain, in the first T20 international in Durban on Friday. Rory Kleinveldt's three-wicket haul highlighted an impressive bowling display from South Africa as they bundled the tourists out for a paltry 86 runs in 18.2 overs. Du Plessis then struck an unbeaten 38 off 32, and along with a handy 28 off 23 balls from debutant Quinton de Kock, carried his side to an easy win with 47 deliveries to spare. “It’s a great start. As captain you want these sort of games. Everything went well," he said. “All the bowling changes worked, everyone took wickets, everyone bowled well. We had them under pressure the whole time, our fielding was excellent and then our batting was also really good. Apart from Kleinveldt’s return of 3/18, there were double wicket hauls for Dale Steyn (2/13), debutant Chris Morris (2/19) and spinner Robin Peterson, whose 2/8 was the most economical figures by a Proteas bowler in T20 cricket. Du Plessis felt the discipline they displayed had set them up for the comprehensive win, which was made all the more impressive considering their starting XI featured three debutants -- batsman Henry Davids, wicketkeeper De Kock and pace bowler Morris. He admitted, however, that the Kingsmead track had made it difficult to score runs. “The conditions were tough and if they got 120 or 130 I think it would have been quite a challenging score,” the skipper said. “In hindsight, it’s a nice thing that we batted second because we knew what the wicket was going to be like. New Zealand captain Brendon McCullum, one of six batsmen in their top seven who failed to reach double figures, said the tourists had fallen short with their attacking approach. “We just couldn’t execute our skills the way we wanted to and that’s effectively whey we lost the game,” McCullum said. 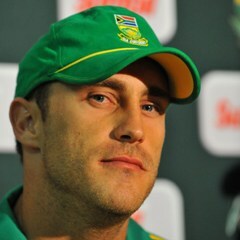 “I thought we were overly keen, myself included, just to get into the series and to take South Africa on. South Africa face New Zealand in the second round of the three-match series in East London on Sunday.